NAKANO Naoyoshi was one of the vassals of II Naomori and they were related by blood. He married one of the daughters of OKUYAMA Tomotoshi. After the death of Naomori in the Battle of Okehazama, Naoyoshi became a guardian of Naochika by his will. Then he was titled Shinanonokami (*) and wrested control from ONO Masatsugu who plotted to take over the Ii clan and continued ruling Ii-no-ya even after the assassination of Naochika. But in 1564, he died when he attacked Hikima Castle, current Hamamatsu Castle. NIINO Samanosuke also died in the attack and it made Nankei Zuimon and Yuen-ni, mother of Naotora decide to make her as the head of the Ii clan. In this drama. he serves the Iis and hates the Imagawa clan under the influence of Naohira. Before the Battle of Okehazama. he makes blacksmiths to make spears and tells Naochika that preparation for action is more important than actual fighting. (*) At that time, some of such titles were not official but self-appointed ones especially among the lords and their vassals in rural areas. OKUYAMA Inabanokami Tomotoshi was a samurai who had relations with the Iis and served them. He is a maternal grandfather of II Naomasa for one of his daughter married II Naochika. And the others married some vassals of the Iis including ONO Genba and NAKANO Naoyoshi. The Okuyamas had a relationship with the Ii clan. He participated the Battle of Okehazama and survived after losing the battle while His son Magoichiro helped his lord II Naomori commit hara-kiri in the battle in it. He was killed in 1560 or 1562 by ONO Masatsugu. In this drama, he is described as a man who loves his children and comes into collision with ONO Izuminokami Masanao and his son Tajimanokami Masatsugu. In the Battle of Okehazama, he survives but is severely injured and Masatsugu kills him in self-defence at last . Newly-married Naochika plays the flute and his wife Shino taps a tsuzumi in the residence of the Iis. Jiro Hoshi who goes begging for alms hears the sound from somewhere and remembers her tsuzumi given by Naomitsu, father of Naochika in her childhood. 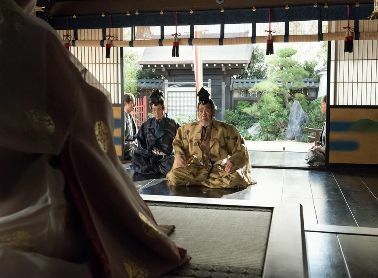 NIINO Samanosuke and ONO Tajimanokami Masatsugu visit IMAGAWA Yoshimoto to ask permisson of the return of Naochika and his succession to the IIs. Then Yoshimoto orders the land survey of Ii-no-ya instead. II Naohira is pleased that the orders of Yoshimoto is not serious as he anticipated but when he learns the land survey, he goes up in the air for he has a hidden village in his fief Kawana, one of the area in Ii-no-ya. Naochika goes there to see it and finds there are many terraced rice fields and peaceful. Naohira says it's a place for shelter the people in Ii-no-ya when the Imagawas attack there, not for tax dodge. Niino Samanosuke (Shunsuke Kariya, centre) and Ono Masatsugu (Issei Takahashi, left) at the residence of the Imagawas. Naochika is busy with trying cover-up the village and planning how to entertain the survey team. So he is away from home most of the time including asking help for Jiro in Ryotanji Temple. His behaviour worries Shino but he is insensible of her feeling. Meanwhile Masatsugu and his younger brother Genba begin checking the documents on the yield of the areas in Ii-no-ya. One night he shows Masatsugu two documents one of which is regular but the other is a secret one that contains the information of the hidden village. He believes Masatsugu completely and pushes everything on the matter of the village onto him but such behaviour of Naochika makes Masatsugu get angry. Naochika cannot read his mind as well as his wife's mind. Masatsugu decides to make the matter on the hidden village secret but still has the document on it. On the first day of the land survey, Jiro finds Masatsugu prays something near the well of Ryugu-kozo. He tells her that he hopes everything will go well as he wishes. The team comes to Ii-no-ya and accurately measures the rice fields. It seems to be impossible to disguise Naohira's village from them perfectly. Meanwhile Jiro and Naochika are looking forward to Sena's response for her letter in which she asks about the information of the survey team. Jiro is concerned about "everything will go well as he wishes", words of Masatsugu and afraid of his betrayal but Naochika tells her that he and Masatsugu share the same idea. That night Jiro visits Masatsugu and asks him to help Naochika on this matter. She decides it based on her own thinking but Masatsugu, who knows she didn't visit him on behalf of Naochika treats her coldly. He tells her to return to the temple however she keeps sitting there consistently. But on the following morning, she comes to her senses and realises that Masatsugu has departed to Kawana with Naochika, Naohira and the survey team. Jiro goes to her parents' residence and receives a letter of Sena from Nankei there. She makes a horse run to Kawana to help Naochika but it makes Shino feel sad. Land Survey is over in Kawana but a certain Iwamatsu, head of the team feels something suspicious and goes forward to the hidden village strongly. He asks Naochika whether the village belongs to the Iis or not. Naochika answers it is not the fief of the Iis but is driven to a wall. He signals Masatsugu with his eye and Masatsugu, who is at loss for words but explains the team that a prince of the South Court (*) lived here so it doesn't belong to the Iis. Then Jiro appears and chants a sutra for the deceased wife of Iwamatsu. She learns he loves number, mathematics and his wife from Sena's letter and the day is a monthly anniversary of her death. Naochika (right) makes Masatsugu explain about the village to Iwamatsu. After the survey, Naochika requests Masatsugu to support the Iis for O-Towa (Jiro), but Masatsugu tells him that he dislikes that kind of things about him. Masatsugu is displeased that he constantly speaks of O-Towa (Jiro) whenever he opens his mouth. On the other hand, Naomori and Chika offers Naochika to move to Hoda mura, a village in the opposite side of the mountain for his frequent visit to Jiro makes Shino uncomfortable. Naomori says that there is a strong bond between him and Jiro but he needs to have another bond with Shino also and it will be strengthen by having their own child. And Genba marries Natsu, younger sister of Shino for Naomori thinks that the Iis should have relationship with the Onos. And in Sunpu. Takechiyo, who celebrates coming-of-age ceremony and names himself Motonobu marries Sena. （*）In Nanbokucho-jidai, the period of South and North courts period in the 14th century, the Iis took the side of the South court and sheltered Prince Muneyoshi (Munenaga) one of the sons of the Emperor Godaigo in Ii-no-ya. The images are from the official website of "Onna Joshu Naotora". SANADA Nobuyuki had six children and two of them participated the Siege of Osaka. He was the eldest son and born in 1595 between Nobuyuki and his concubine who became to be called Seiin-in-den later. After the Siege of Osaka, he ruled Numata in Kozuke, current Gunma and had three children. He died before his father in 1635 and his fief was divided and succeeded by his son Nobunao and his brother Nobumasa. In this drama, he is a son of Nobuyuki and Ko. Being a calm and quiet man, he hesitates to become a heir of the SANADAs. But in the Siege of Osaka, he remonstrated Nobumasa's violent behaviour. He was the son of Nobuyuki and his wife Ina (Komatsu hime). He participated the Siege of Osaka as well as his brother and ruled a part of Matsushiro Domain after that. He was said to have come into collision with Nobuyuki and had the matter of successor. He dies before his father also. In this drama, he is the same age as Nobuyoshi but his birth date is one month later than that of Nobumasa. 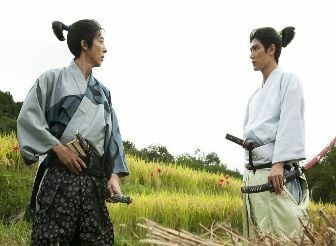 He is described as a rough young man who feels enmity against his cousin Daisuke, son of SANADA Nobushige. 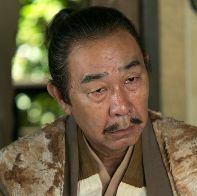 The image shows Masashi Oyama as Sanada Nobumasa. 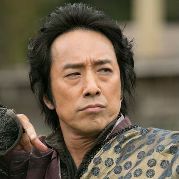 NIINO Samanosuke Chikanori was an elder brother of Chika, wife of II Naomori and uncle of II Naotora. He served the Imagawa clan as vassal. Though the Imagawa clan declined because of the Battle of Okehazama and breakaway of some vassals after it, he still pledged his loyalty to his lord, IMAGAWA Ujimasa. As he was related to the Iis on the other hand, he sheltered II Naotora and her adopted son Toramatsu, later Naomasa in Ryotanji Temple and earned the respect of the priests. He was killed when he attacked Hikima Castle, current Hamamatsu Castle. 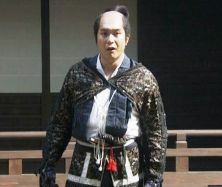 In this drama, he is described as a METSUKE, who oversees the IIs on behalf of the head of the Imagawas. However, he is trusted by Naomori and is appointed as eboshi-oya (*) for Naochika. And he is scolded by his sister Chika for the poor administration of him and Naomori that finally made her daughter O-Towa become a priest. 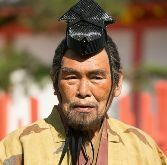 (*) A man who puts eboshi, a kind of cap for samurai in the Middle Ages on a young man's head at his Genpuku shiki, coming-of age ceremony.